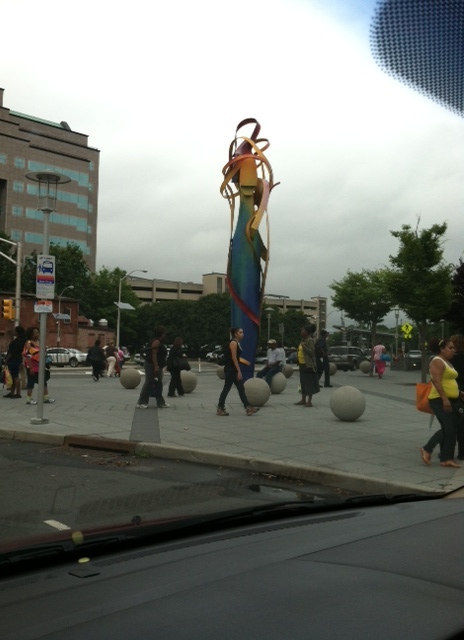 Trenton, New Jersey! The New Jersey state capital. I get to work there and it never ceases to amaze me. First, the people. My biggest complaint about the People of Trenton is that they don’t know to “cross on green.” It would really help traffic patterns and us out-of-town road-ragers if they’d just follow this simple rule. I may send an email to the elementary schools and ask them to teach it. I can’t tell you how many times I’ve almost run over someone walking or biking across the street against the green, or almost got rear-ended for slamming on my brakes to avoid such an accident. I also don’t understand the litter. For a week I walked by a dirty diaper on the sidewalk. Who does that? People don’t pick up after their dogs, either. It’s gross. On Monday mornings I could probably make some nice money by picking up empty beer cans and bringing them over the river to Pennsylvania for a five-cent per can profit. I’ve seen it all– condoms, syringes, random clothes, food. I know it’s a city, but still. New York doesn’t look like that. Don’t Trentonians remember the commercial with the crying Native American dude? I’ll ask the elementary schools to teach about city pride and picking up litter in my email about crossing on green. Despite the people and the litter, Trenton has some redeeming qualities. Umm . . . hmm. Give me a minute. . . Oh! We have the Trenton Thunder, our minor league Yankee affiliate (AA) team! I got to see Derek Jeter play there about ten years ago while he was rehabbing. Love him or hate him, A-Rod was recently in Trenton doing the same. What else? Hmm . . . We have a State Prison! Once on my way to work, a bad guy escaped and was running through the streets resulting in a total shut down of my commute highway. Rush hour, 9:00 a.m., and the one highway leading into the state capital city was closed– a parking lot. At first I was annoyed but then I carpe-diemed and realized that I was stuck. Alone. Not at work. With a perfect excuse. Utilizing the wonders of 3G, I parked the van in the middle lane of the highway along with the other stranded commuters, pushed back my seat, and watched an entire episode of Friday Night Lights while eating my lunch for breakfast. It really was quite pleasant. But I digress . . . I was telling you good things about Trenton. Riiggghhtttt . . . While I think more on that, I’ll get to my point. Today I want to share two pictures that I took on the way to work that really make me wonder. What exactly is that growing out of this building and where is its source? Is it a banana tree? A giant weed that worked its way up the drain pipe? I don’t get it. It’s like it grew out of the brick. This is the corner across from my building. I get to walk this sidewalk from the parking lot to the building every day. I’m not sure if you can tell from the picture, but there are UTILITY WIRES HANGING DOWN close to the SIDEWALK. No joke. They hang low enough that I walk into them if I am not paying attention (which is always). 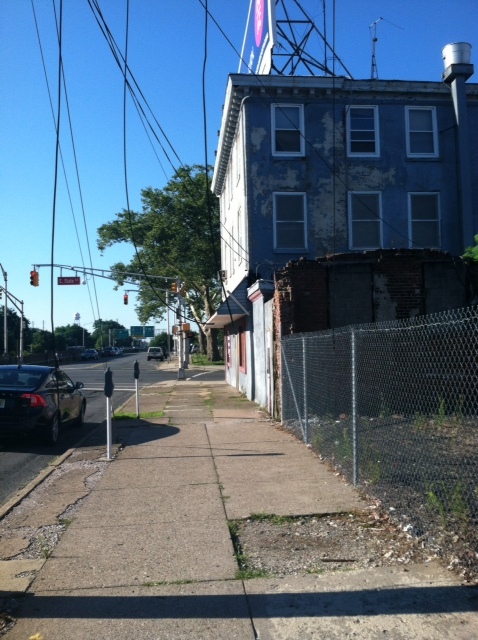 Isn’t it bad enough that the sidewalk looks like that and there is a dilapidated building adorning the street? Now I have to risk electrocution too? In case you are wondering, the sidewalk on the other side of the street, which I wish I had a picture of, is bordered by a four-foot wall that overlooks a major highway about thirty feet below. I used to walk on that side until a co-worker pointed out that someone could literally throw me over the wall to my death in one easy swoop. My choices then are (1) risk electrocution from the hanging wires, or (2) risk being thrown onto the highway. Fun way to start the day, yes? I called the police regarding the hanging wires. On my first try nobody answered. This didn’t shock me since recently the mayor was indicted after a criminal investigation and there’s no money in the city so a gazillion police officers were let go. On the second try I was able to reach a very nice lady who told me she would “send someone over.” That was a week ago and the wires still hang. There are three major cities in New Jersey: Trenton, Newark, and Camden. Newark has an airport, Cory Booker, and Portuguese restaurants. Camden has a view of Philadelphia, a Rutgers campus, and an aquarium that’s pretty neat. 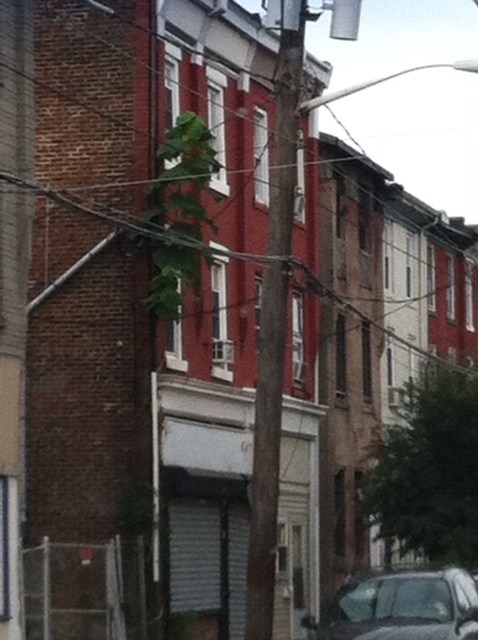 Trenton has hanging wires and weird weeds. I didn’t even tell you about some of my encounters with the Trenton public– that’s for another blog post. But I’ll tease you with this: Ramen Noodles and a Dancing Lady are involved. I know you are holding your breath waiting for that post! A flame? A woman? A woman in flames? Thanks to all for reading (and for your kind words on my I’m-in-a-rut post yesterday– I’m trying to de-rut). I appreciate you. I think Trenton gives Poughkeepsie a run for its (lack of) money. Okay, I live in what use to be Hell’s Half Acre, and our city managed to clean up better than that!! LOL – I feel very blessed to work from home after reading this! The two options of sidewalks you have, well, I’ll just start sending good energy your way for your morning commute!